Apple Pie Sangria is a light, refreshing, delicious, and EASY Caramel Apple Sangria! This Fall Sangria Recipe is the hit of every party I take it to! 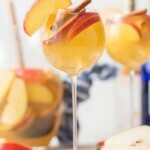 Apple Pie Sangria is loaded with Apple Cider, Caramel Vodka, White Wine, Ginger Ale, and more! We call this Thanksgiving Sangria because it's Autumn in a glass. We have sangria recipes for every occasion, but this one is our favorite. Add in the ginger ale and stir before serving.